Good morning everyone, and happy Wednesday! You've made it through half the week, so congratulations on that! Hopefully I can keep the content flowing, and give you some distraction to help you get through the day. In my opinion, today's guest post definitely fits that bill. 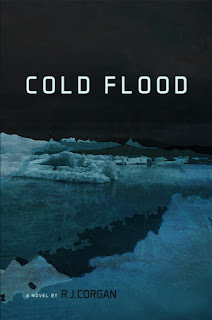 R.J. Corgan is here, talking about his characters in Cold Flood. I think you'll enjoy this! For geologist Kea Wright, when a volcano erupts under an ice cap, it isn't just a good time, it's a living. Camped at the base of an icecap in southeast Iceland, geologist Kea Wright and her team are investigating landforms created by catastrophic floods. With only days left in the field season, bad weather on the way, and the volcano due to erupt at any time, the team is struck by a tragedy that threatens to shut down the entire project. As the team rushes to complete their work, the expedition continues to be plagued by setbacks, leading Kea to wonder if the initial tragedy was an accident after all. During her reluctant - and inept - attempts to investigate, Kea inadvertently stumbles upon a secret. One so valuable, someone is willing to kill to keep it hidden. Asked to read a first draft, a beta reader informed me: ‘It’s okay, but your main character doesn’t have enough flaws.’ A second reader said of the same draft replied, ‘She has too many flaws!’ This led me to ask the question: When is your lead character sufficiently flawed enough to be interesting, but not too much that it alienates the reader? In the case of Sherlock Holmes, the character does heroin for a little while, either for undercover work or for fun/addiction, but only enough to make him dark and edgy. Watson, the reader’s relatable guide, dries him out. You can make you character an alcoholic, but at some point the character has to remain vertical long enough to solve a crime. During the first character designs for Kea Wright in Cold Flood, I threw an awful lot of potential flaws at her, including alcoholism. However, the more I spent time with Kea, her overly dramatic flaws fell away. At her heart, she is just a scientist who loves glaciers, geology, and being outside. What she doesn’t love is having to play den mother to a bunch of volunteers who are using her expedition to play out their petty rivalries. Thank you to R.J. Corgan for this wonderful guest post! Make sure you check out his book, and stay tuned for a review of Cold Flood very soon!